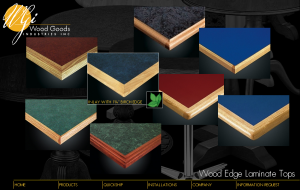 Zeal Solutions Custom Web Services - Portfolio / Wood Goods Industries, Inc. Create a website in collaboration with a graphic designer to reflect their new catalogue design and better display products. Zeal Solutions worked with the graphic designer to create a web-friendly version of their catalogue that takes advantage of both the well-designed catalogue and internet technology. We worked directly with the graphic designer and contacted Wood Goods through email and phone.